3 losses in a row are tough. That’s about the most consecutive losses that novice traders are psychologically prepared to accept before they feel compelled to take action and ‘correct’ the situation. Frustration – Why me? I’ve worked so hard. Everyone else in the forum appears to be getting good results with this strategy? Nothing ever works out for me. Anger – That strategy developer is a liar and a crook. My broker is running my stops. Someone should be held accountable for this. Doubt – What if the strategy doesn’t work? What if I can’t trade? How am I going to support my family? Fear – I can’t lose more money, what will everyone say about me when they know I’m a loser? How can I tell my wife/husband that I’ve lost again? And if that’s not enough, the novice trader will likely be afflicted with the crippling inability to pull the trigger on the next trade, in fear of hitting a fourth loss in a row. Totally abandoning the strategy, usually followed by returning to their favourite forum to find the next Holy Grail strategy that is designed to make their dreams come true. Is this the right response though? Typically, trading decisions which are influenced by emotions rarely result in the right action. First, before we continue, you need to confirm that you do have a valid, proven trading strategy. Have you conducted appropriate testing to satisfy yourself that it provides a positive expectancy? If not, stop trading it right now and return to testing. I don’t care what reason you had for jumping straight into a live trading environment, but the fact is that it’s difficult to psychologically trade a strategy in a consistent and disciplined manner when you don’t have complete confidence in its rules. You need to conduct thorough testing. But assuming you have a strategy that has proven itself through positive results either in a testing or live trading environment, simply refer to your testing results or past trading history, and you’ll confirm that three losses in a row is a quite normal occurrence. In fact, it’s quite normal to have a lot more than three in a row. And it does not mean that your strategy is flawed. Let’s look at this from a purely statistical perspective. Would you like to discover a quick and simple risk management strategy that is easy to apply to any trading plan, and has the potential to vastly improve results? Excellent! I’m not talking about the placement of stop losses, which is what most people consider as ‘risk management’. Rather, this is a simple tool for managing the risk in your trading business. There’s a whole lot more, but hopefully you get the point. One flaw in many trading plans is the absence of a valid strategy for managing these risks. So, let’s fix that situation. Welcome back to another installment of support and resistance. Today we’re going to have a quick introduction to another feature of the market which can lead to the development of support or resistance areas – round numbers. In analyzing a market, I never use this as a stand-alone method of finding support or resistance levels. Rather, it’s a factor which will simply increase confidence in an area already identified as support or resistance. However, once you know to look for this, you’ll be amazed at how often a round number does seem to act as a barrier to price flow. What do I mean by round numbers? Rather than develop a rule, let’s just look at some examples and it should become fairly obvious. For a highly priced stock, it might be price in the region of $70, $80, $90, $100, $110 etc, or any multiple of $10. For a mid-priced stock, it might be price in the region of $25, $30, $35 etc, or any multiple of $5. For a low-priced stock, it might be any multiple of a dollar, such as $7.00, $8.00, $9.00, or even multiples of 50 cents, such as $5.50, $6.00, $6.50 etc. For the penny stocks, you might look at multiples of 10 cents, such as 0.10, 0.20, 0.30. Forex? Yeah, it works here as well. GBP/USD at 1.9600, 1.9700, 1.9800, and even the 50 levels 1.9650, 1.9750, 1.9850. In fact, this concept applies to any market. If there’s no evidence of past support or resistance through swing highs/lows or congestion areas, then it simply provides a warning area. For example, if I’m long in a trade and it’s seriously overextended to the bullish side and approaching a round number area, I’ll expect some profit taking at this area and therefore potential resistance. So I might choose to lighten my position, or tighten my stops. How do round numbers become support or resistance? Yeah, trading is hard! There’s no doubt about that. But let’s see if I can provide you with a different perspective from which to view these challenges. What is causing you problems in your trading is part of the process of becoming a trader. The problems you faced in the past, and overcame, were the part of the process that led you to where you are right now. The problems you face today – that you will overcome today or tomorrow – are the part of the process that leads to your trading future. And that trading future, if forged through a process of self-improvement and overcoming trading challenges, can ultimately lead to only one possible outcome – trading success. The quicker you can identify the challenges and find the path to overcoming them, the quicker you will progress towards success. So embrace the challenges. The only way you can ultimately fail is through failing to progress along the path to success, leading you to quit out of frustration. Failing to progress comes for most people through failing to accept the problems. Instead of identifying and facing the challenges, most people keep themselves busy surfing trader forums or testing indicator after indicator. Keeping busy creates the illusion of progress, when in fact the trader’s progress has stalled. So, what can you do to continue to make progress on your trading journey? Welcome back to the third article in the current support and resistance series. In the last article we discovered how swing highs and lows lead to the development of support and resistance areas, through the actions of traders – either through an expectation of these areas holding, or through traders being psychologically forced to exit a losing trade at breakeven. If you missed the first two articles in the series, or didn’t quite get the concept on the first reading, please review part one and two here: (S&R part 1, S&R part 2). The good news is that if you understood the concept from the swing highs and lows article, this one will be easy. Areas of congestion are the second price formation that I look for in identifying possible areas of support or resistance. What is congestion? A simple definition is that it’s any sideways price action. Look for price that is contained within a narrow range, often with alternating price bars up and down, and no trending action. Once again though, as with the swing highs and lows, I don’t get too worried about definitions. If it looks like congestion, it is congestion. They say a picture is worth a thousand words, so let’s look at some charts which should make the concept fairly clear. Look, there are many problems with calling something like this a strategy, but the one I want to discuss today is simply that each of these indicators belongs to the same class of indicator. The RSI, the stochastic and the Williams %R are all oscillators. An oscillator is a momentum based indicator that moves above and below a horizontal axis representing a position of neutral momentum. Now each of these three oscillators measures momentum slightly differently. 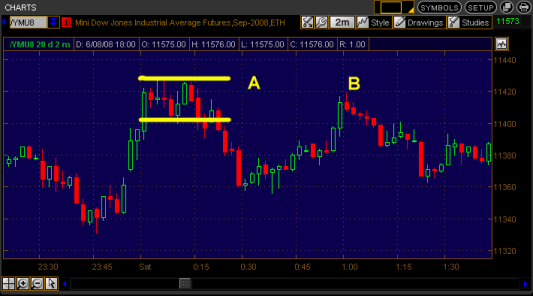 RSI measures it through comparing the magnitude of higher closes to lower closes over a set period of price bars. The stochastic measures it showing where the current close fits relative to a high/low range over a set period of price bars. The Williams %R works on the same concept as the stochastic, showing the relationship between the current close and the high/low range set over a period of price bars, however it does so through a different formula. Basically, all are measuring the same thing. Quite likely, you’ve added some extra complexity to your strategy that serves no useful purpose at all. Is there ever a need for more than one oscillator? Possibly, yes. It depends on what you’re trying to achieve. You might use one for indicating oversold or overbought price areas, and a different one for indicating increasing or decreasing momentum. You might even use one indicator twice, with different parameters, to represent momentum over both a shorter and longer time period. In this case, it’s fine. However, I suspect many traders when developing their trading approach don’t really think about it to this degree. I suspect most just slap an indicator on their chart for no other reason than their platform provides it, and then look through the price history to see whether it shows potential for profits. In this case, they can probably benefit from removing any redundancy. Trend indicators, such as moving averages, directional movement or trendlines. Volatility indicators, such as bollinger bands, average true range or standard deviation. Oscillators such as RSI, stochastics and Williams %R. Volume / Market Strength indicators, such as volume, on balance volume or money flow index. Generally you shouldn’t need more than one indicator to determine trend, one to determine volatility, one to determine momentum, and one to measure volume. In many cases, through a study of price action, you can even eliminate those single indicators and determine trend, momentum and volatility through price alone. Of course, that’s not for all people. What I encourage you to do is to look carefully at the indicators you’re using. Do you have more than one indicator from any of the indicator classes? If so, is there a valid reason for it, or is it simply redundancy that has slipped unnoticed into your trading strategy? More often than not, I’d suggest your strategy could benefit from removal of that extra redundancy. Trading is one business where ‘simple really is best’.